We take up psychology writing assignments and online psychology tutor jobs to help college and university students worldwide. 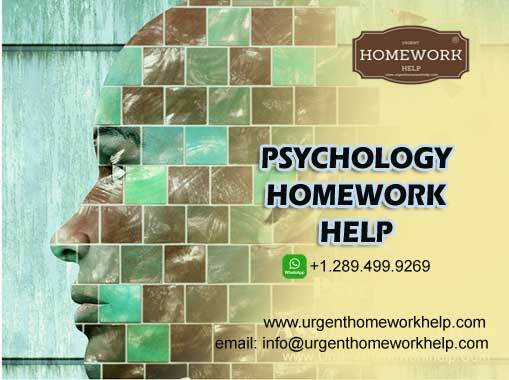 At UrgentHomeworkHelp.Com, we write psychology homework answers for college and university students worldwide. There is a high demand for Psychology online tutors amongst students because of the often complex and abstract nature of the topics they are expected to study while pursuing their graduate or post-graduate courses. If you feel this almost explains your current situation, then rest assured, you have arrived at the right place. Our psychology assignment experts have helped thousands of students to get top marks in their college or university assignments. Our psychology assignment experts write some of the best homework assignments which cover the basics of Psychology right upto the advanced concepts. They also provide some valuable insights on research topics as well. Online assignment help provided by us is affordable, reliable and most importantly, 100% plagiarism-free. We work 24x7 including weekends and holidays and our customer success team is always available on chat on our website to answer your questions and help you. We are only an email away. All you need to do is to drop us an email at info@urgenthomeworkhelp.com and one of us will get in touch with you right away. WE HELP WITH COLLEGE PSYCHOLOGY HOMEWORK & ASSIGNMENTS. CLICK HERE FOR AN INSTANT FREE QUOTE. WHY DO YOU NEED PSYCHOLOGY HOMEWORK HELP ONLINE? In order to write a good assignment, you will need to first have a good understanding of the subject. Psychology is the branch of science that studies human and animal behaviour and tries to make behavioural predictions based on a pattern of past behaviours. Psychology is not magic and psychologists are not similar to astrologers, numerologists, palmists etc because psychology is a science. Psychologists cannot read your mind by just looking at your face! There is psychology is every aspect of our lives and at every stage of our lives. An infant thinks very differently from an older child. Older children) think differently when complared to younger adults. Young adults think differently when compared to older adults, middle-aged individuals. Senior citizens deal with their set of thoughts and behaviour patterns. People think and behave differently when left to themselves and when they are put in a group. People in high positons think and behave differently when compared to those in the lower levels of heirarchy. People with power behave differently when compared to when that power is taken away from them. There is psychology in industry, technology and even color. A psychologist studies all of these and leverages that learning to the larger benefit of the human society. As a full-fledged psychologist, we will be faced with a number of unique situations and people will expect you to solve all of them. Our experts are full-time Psychologists with a great deal of academic and practical knowledge. The assignments they write for you will be an immense source of valuable knowledge which you can use even for later reference. PSYCHOLOGY STATISTICS HOMEWORK HELP? CLICK HERE FOR AN INSTANT FREE QUOTE. Term-end or semester-end homework and assignments are a great way of evaluating the students level of understanding of the subject. For the student, it is an opportunity to showcase to your professor or teacher how much you have learnt and understood. A well-researched, well-written, well-formatted psychology assignment is sure to get you top marks than those that are done in a hurry and shabbily presented. True, you may not have the time to put all your effort into it, but that is no excuse not to submit a professional psychology homework assignment. Get in touch with us so that our experts can write an excellent psychology homework assignment for you. Submit it to your college or university and get top marks. Remember, students who get top scores will not only have the respect of the instutution, but also that of employers and the rest of the society as well. Your information with is kept absolutely confidential and never shared, sold or even discussed with any third-party. As you can see, there are a number of disciplines and branches in Psychology and even if you are a master in all or most disciplines, you may still need to seek help from a Psychology assignment expert so that your homework assignment stands out due to superior quality, content, formatting and knowledge. LET US SEND YOU A FREE QUOTE TO ANSWER YOUR PSYCHOLOGY HOMEWORK QUESTIONS. CLICK HERE. Get a free quote from us and pay the amount on our website. Get a guaranteed delivery date. Your fully completed psychology homework assignment is emailed to your inbox on the guaranteed delivery date. Take it from your inbox and submit it. Do you need urgent assignment help? Something that needs to be submitted in a hurry? We can help. Our team of expert psychology assignment writers can handle even the most difficult, last-minute requests. We can write up an excellent psychology assignment for you overnight, if required. When you buy Psychology homework help from us, we get our most qualified expert to work on your project. These individuals are experts who have had many years of experience working on live Psychology consulting situations. We make sure that there is no time lost after we receive your order. Our experts are passionate about Psychological consulting and treatment just as much as they are about making sure that they are able to help you get the top scores. We will keep you posted with the status of your Psychology homework assignment at every stage. LOOKING FOR A TUTOR TO HELP WITH YOUR PSYCHOLOGY HOMEWORK ASSIGNMENTS? ASK FOR A FREE QUOTE. CLICK HERE. HOW TO ORDER PSYCHOLOGY ASSIGNMENT HELP ONLINE? Placing an order for psychology assignment help is as simple as sending us your requirements using the ORDER NOW form provided in this page, on the right. Just fill in your contact details, add any additional information and attached relevant reference documents, if any, and send it to us. We will review it and contact you right away. And oh! remember to tell us when you need it completed. OUR HOMEWORK EXPERTS CAN ANSWER ALL YOUR PSYCHOLOGY QUESTIONS. ASK FOR A FREE QUOTE. CLICK HERE.